Would you like to be successful? Go back with me to the summer of 1981. We were sliding downhill into the worst recession that I ever experienced. I’m 81 years old. Chick-fil-A was in the midst of a huge giveaway sales promotion. Every customer was given a scratch-off reward card that permitted everyone to get something free on their next visit. The customer response was overwhelming! One of the most popular giveaway selections was our made-on-premises Lemon Meringue Pie. It was the most labor-intensive item on the menu. The franchisees had employees working around the clock to keep up with demand. The home office was flooded with franchisee calls about the problems, especially labor problems, the promotion was causing. Wow! Don’t you agree that we have surely been blessed by the customers response to the First’n Best campaign? In other words, if you want to enjoy the increase (profit) of the oxen (business), then you are going to have to be prepared to shovel manure (work hard). Obviously, with more oxen (business) there is going to be more manure (work). As for me, I have put on my gloves and my high rubber boots, and I am digging with the biggest shovel I can find! How about you? Are you prepared to pay the price of success? How big is your shovel? One of our franchisees responded with this message. We received your note today regarding oxen and manure. If you know of anyone who is cursing his oxen, we’ d be happy to take them off his hands. Enclosed herewith, for your desk, is a scale model of the shovel we use. Now that’s a big shovel! Success is available to those who are willing to shovel manure–only those who are willing to shovel. 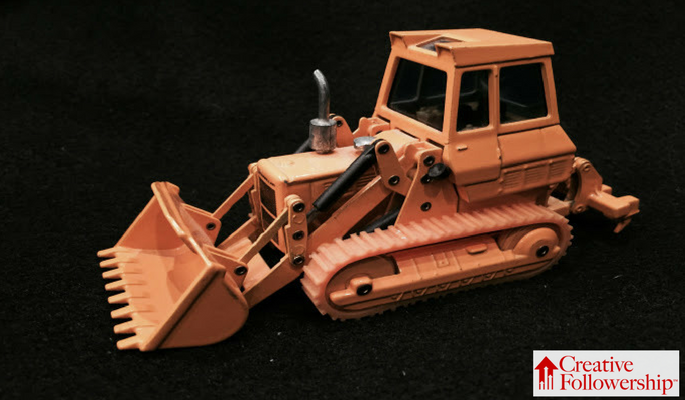 Enclosed was a miniature model of a Caterpillar front-end loader! Claudia, I liked it too! Chick-fil-A was among the last to serve Lemon Pie. Unfortunately, it is not popular among the younger customers. I’ve made so many, like riding a bike… I could even give Zelma a run for her money. Thank you for so much wisdom and patience, …and for helping me to value the gift of learning. Partrick, it was a great privilege for me to have Zelma Calhoun for my lemon pie making teacher shortly after I went to work for Truett Cathy in 1968. She was and still is the best!